INDIANAPOLIS — President Barack Obama said Friday that he dropped a widely criticized plan to scale back tax benefits for college savings accounts because the savings weren’t worth it. Obama, who revealed that he uses the 529 savings accounts for his own daughters, said he looked at reducing the tax savings because the accounts tend to be used by “folks who were a little more on the high end.” He says other taxpayers struggled to save enough to participate. About 12 million families take advantage of college savings plans, in which money can eventually be withdrawn with no tax on earnings to pay for postsecondary education costs. About half the accounts were held by families making more than $150,000, according to a 2012 report by the Government Accountability Office. The administration initially estimated that scaling back the tax breaks would bring in about $1 billion over 10 years. Obama had planned to use the savings to help fund his proposal to make two years of community college free for all. 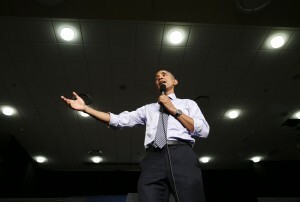 “Our thinking was you could save money by eliminating the 529 and shifting it into some other loan programs that would be more broadly based,” Obama told a crowd of nearly 400 at a town hall meeting at Ivy Tech Community College. But he quickly backed off after lawmakers from both parties objected. Obama’s remarks were his first on the matter since the White House announced the shift last week, saying the issue had become a distraction. The president’s comments came in response to a question from a woman who said she uses the accounts to help her grandchildren. The president mixed politics with the personal as he touted his higher education agenda while talking about his own experience as a one-time student and the father of a daughter on her own college hunt. In response to a questioner who asked about help paying the rising costs of books, Obama said he understood the problem all too well after having to buy his own during undergraduate and law school. “I addition to the bonds of love, we had the bonds of debt. Our net worth was negative,” Obama said. Obama chuckled at kids these days on the college hunt. His older daughter, Malia, is checking out colleges during her junior year of high school. “The chances of an Achilles tear or an ACL injury is increasing each month, and then the satisfaction that I get from playing diminishes because I am so bad,” he said. He said the likelihood of injury is much lower with golf, which he plays most weekends when the weather permits.